Sikkim is an Indian state adjacent to Darjeeling hills and nestled between Nepal (on its west), Bhutan (on its east) and Tibbet on the north. It has more than 15 magnificent peaks that are over 20,000ft in elevation. And the trek through Yuksom, Dzongri and Goechala offers breathtaking views of several of them that includes Kanchenjunga - the third highest peak of the world and several others like Pandim, Kabru, Ratong and more. Trekkers know... this is a journey through paradise. For trekkers, Dzongri and Geochala are probably the best places to experience the awesome Kanchenjunga face to face from the closest possible distance. This Sikkim trek is also often known as the 'Trek for Kanchenjunga'. This is considered a moderate to difficult trek. The trail also takes you through several of the 164 monasteries of Sikkim that so diligently preserve the religious culture of the province amidst an ever changing world. The route also offers a fascinating glimpse to some of the 45 varieties of rhododendrons, over 400 varieties of orchids and thousands of different plantations that Sikkim boasts of. Below I am suggesting a 11-day trek for Dzongri & Goechala area of Sikkim. However, you can shorten the trek duration (not the route) by cutting down on your night stays if your stamina permits. If you are an experienced trekker, you can easily cut short the time by 2 to 3 nights. From Darjeeling, take a vehicle and reach Pemayangtse (2,082m, 6,840ft) in Sikkim. The distance is 120kms and it takes about 4-hours to reach. From NJP/Bagdogra, it takes about 5 and half hours by car. Start your trek next morning. The essence to trekking in this part of Sikkim is to go slow and be patient. The gradients at some places are quite steep passing through rocky terrain and the trek can become arduous. There are leeches on the way. The Tour Operators usually provide a bamboo stick with a bag of salt tied at the bottom to help get rid of the leeches. They also provide a soap coating for the shoes that repel the leeches. NOTE: Unless you have arranged the trek through a Tour Operator, you will need to get a guide, a porter, a cook and yaks to carry your loads. If you plan to start your trek from Yuksom, you will get guides here as well. In that case, you will need to pay for guides, porters and yaks on a per day basis. You will also need to hire all other stuffs like tents, sleeping bags, stove, utensils etc. Foreigners are required to book the trek through a tour operator registered with Sikkim Tourism Department. Go through the Dzongri Permit Section to know about all the permits to be obtained before you can start the trek and how to get them. If you are short in time, you can skip this stretch and drive down to Yuksom which is 35kms away from Pemayangtse and 40kms from Pelling. It takes about 1 and half hours by car. However the trekking route up to Yuksom is only 16kms and takes about 7-hours of hike. This stretch actually gives you an opportunity to get acclimatized for the harder treks ahead. Whatever you decide, don't miss out on the Pemayangtse Monastery before you start your journey for Yuksom. It is one of the oldest and premier monasteries in Sikkim. 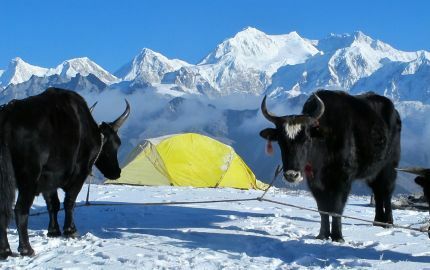 Although loosely called as yaks, the domesticated animals used for carrying heavy loads for the treks are a cross between a male yak and a cow. Locals call them Dzo. The trail goes through scenic pastures and fields of paddy, corn and barley. Although sparse, the population here includes Nepalis, Lepchas and Sherpas. You will see village huts as you walk along. You will pass by mountain streams like Rimbi Chu and Ratong Chu. Yuksom is like a flat tabletop with barley fields & apple orchards and surrounded by mountains. From here you get a great view of small lakes. The Dubdi Monastery here is located on a hill top and can be reached through a trekking trail, it takes about 35 minutes. The monastery is steeped in history. It is here where coronation of the first religious king of Sikkim H.H. Funchook Namgyal took place. It was done by Lama Gyalwa Latchen Thembo who brought Buddhism to Sikkim in 1641 AD. The monastery was built soon after the King was crowned. There are tourist lodges in Yuksom for night stays. One of the better ones is the private hotel Tashi Ghang which offers 3-star equivalent accommodation. Other lodgings include Hotel Demazong which also has dormitories. Although the trek starts from the market area, the trail then goes along the outskirts of Yuksom. You will get your permits at the KNP (Kanchenjunga National Park) check-post on the way. It hardly takes time to get one. This stretch of the trail is mostly paved with stones and climbs through dense tropical forests of pine, bamboo, fir, oaks and flowering trees like magnolias and rhododendrons. You will see different kinds of orchids on the way. The stretch is also a paradise for bird and animal lovers. Other than many species of birds, the forest area here is a habitat of varieties of animals including red pandas, Himalayan black & brown bears, barking deer, wild goats, Tibetan antelope and lot more. Don't worry, they won't come on your way. You will then cross four bridges one after the other. One of my favorites is the wooden hanging bridge that comes soon after Sachen (a tiny place which has a log hut with accommodation for 5-6 trekkers and a small area for cooking). You will find lots of colorful prayer flags fluttering on the bridge wishing you good luck for the steep climb ahead. Shortly thereafter, the climb gets quite steeper through a series of switchbacks. Having trekked for about three hours, you should plan to take your lunch at one of the road side huts. After about 6 & half hours from Yuksom (14kms), you will reach the forest bungalow at Bakhim. This is where you will stay overnight, unless the tour operator organizes camping at the site. Alternatively, take a break at Bakhim, have some refreshment at the nice tea stall here, soak in the wonderful views of the Yuksom valley and move on to the village Tsokha, which is about 1 hour uphill trek. Many trekkers do that as well, but it can be a long tiring walk (gradient to Tshokha is steep). From Bakhim the climb gets really steep all the way up to Dzongri. The distance is about 8kms and you can cover that in about 6-hours. The mantra for this stretch is to go slow. But every step towards Dzongri will only take you closer to the heavenly view of Kanchenjunga. Initially the route passes through land areas that are cultivated through Dzos (kind of yaks) and mountain sheep. After about one hour of climb, you will reach the village of Tsokha where only handful Tibetan families live. This is the last village on the way and there is no electricity here. Some experienced trekkers come up to Tsokha on day-2 itself and stay here at a trekkers hut (this is a long wooden bungalow with four rooms having basic amenities and can accommodate more than 20 trekkers). Few families also offer their huts for overnight stay. Although there are probably only 10-12 families living in this village, there is still a Buddhist monastery built here next to the lake. There is also a forest rest house at Tshokha located little uphill... you can can stay there as well. Tsokha offers the first real view of the Himalayan snow peaks including the Mt. Pandim. There is a plan by the Indian government to develop Tsokha as a place with better amenities and arrangements for trekkers. That would require moving and rehabilitating the existing families elsewhere in Sikkim. The villagers don't seem to be happy with this plan. A steep rocky trail continues from Tsokha. As you trek along, you will pass by varieties of rhododendrons that bloom in spring. The flowers have different colors like white, red, pink etc, some are small but many are quite large. After about 2 & half hours of trekking along a steep gradient, you will reach a picturesque spot called Phedang (also known as Phittang). This is where you should plan to take your lunch. Start your trek after lunch. Soon you will be passing through a dense forest of rhododendron trees. If it rains, the trail here can get quite muddy and difficult for trek. Another 2 & half hours of walk along the steep trail through rhododendron forest and you will reach Dzongri, a place which is also known as "The meeting place of men and mountains, of god and nature". The board on the trekkers hut says "Welcome to Dzongri". The view of the snow range is awesome. You get a great view of Darjeeling's landscape from here as well. You should stay here for the night. You can either stay at the trekkers hut or at tents that are set up by the tour operator. This is a flat area with great views all around. There is a view point at Dzongri (known as Dzongri Top) which takes 45 minutes of walk along a steep trail. You must visit the view point early in the morning. There are lots of Tibetan prayer flags on Dzongri top that keep fluttering in the breeze. The sunrise and the view of the dazzling snow peaks of Kanchenjunga (8534 m), Kabru (7353 m) and Pandim (6691 m) appearing in the horizon is a sight that you won't forget for long. Other great peaks you can see from here includes Koktang (6147 m) and Narsing (5825 m). On the west is Singalila ridge that separates Sikkim from Nepal. 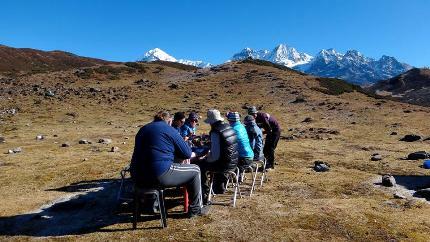 Most of the tour operators plan a rest day in Dzongri camp for day-4 and stay here for one more night. This is to help you acclimatize with the high altitude. However, if you are feeling okay and want to cut short the trek time, you can ask them to restart the trek early on day-4 itself after you comeback from the view point. You may even decide to skip the view point and proceed towards Thangsing. You can visit the view point on your way back as well. From Dzongri you will trek down towards a beautiful valley and then climb for the last one hour for Thangsing. The distance is 7kms and it can be covered in 4 & half hours. You will walk through lush meadows towards this picturesque valley which is located at the base of a mountain known as Jopine. As you walk by the side of the mountains, you get mind blowing view of the snow covered Pandim and Kanchenjunga. It's an awesome feeling that you are only walking to get even closer to these giant snow mountains. As you walk along the meadows, you will notice a series of five chortens (small Buddhist mounds for worships) on the way. There is a stretch that goes through a steep descent and you need to be careful as you take your steps. There is every chance of a slip in this rocky path. Eventually you reach the base of the valley. There is a stream called Prek Chu river that flows through the valley area. The operator wold normally organize a river-side lunch. After lunch, you will need to cross the river over an wooden bridge, then climb for an hour through forests of rhododendrons to reach the camping ground in Thangsing. It is perched on a slope of Mt. Pandim. The tour operator sets up tents here. Chemathang is located at the base of Mt. Pandim and 8kms from Thangsing. It takes about 6 hours of trek to reach Chemathang and the hike is mostly through the valley of Onglathang. All through the stretch you will be treated to amazing views of Kanchenjunga and Pandim, and it gets even better and better as you approach closer to the mighty snow peaks. Initially the route is more or less leveled although there are little ups and downs in between. In about 4 hours, you will reach a place called Lamunie. Some tour operators set up tents here for the day's enjoyment and overnight stay. However it's better to take an early lunch here and carry on so that you get closer to Goechala. From Lamunie, a trek for about one hour will take you to the Lake Samity, a wonderful deep lake with crystal clear greenish blue water surrounded by gorgeous mountains. As you look around, you get amazing view of the snow mounts of Pandim, Kanchenjunga, Kabru and others. The colors in the snow keep changing as the sunlight shifts and clouds pass. Walk around the boundary of the lake and watch varieties of birds. There was a trekker's hut here which has been closed down. Camping is no longer allowed in the lake area. This is a holy lake for the Sikkimese. The last stretch of the route is quite steep and goes through rocky areas full of boulders. You pass by many small lakes, glaciers and glacial moraines to finally reach Chemathang. It's located in a quiet and serene area. Tents are set up here for overnight stay. Goechala Pass is about 3kms from Chemathang on a steep route. It takes about 3 hours to reach and the terrain is full of rocks and boulders. After the first hour as you navigate through rocky hills, you will reach a view point. As you keep approaching the view point, you start getting breathtaking view of Kanchenjunga which keeps coming closer and closer. You are finally standing face to face with Kanchenjunga snow peaks. Goechala Pass is another couple of hours from the first view point. There is a second view point in between which is a glacial lake and can be seen from a ridge. The last 2-hour stretch is the most strenuous one. There is no marked trail any longer. It's a steep uphill rugged terrain through loose rocks. There are also steep descents at some places that you need to carefully negotiate. Then you pass through a glacial moraine, a large flat area which is like a frozen lake covered with snow and surrounded by the gigantic peaks of Kanchejunga, Kabru and Pandim. Once out of the moraine, you will finally start trekking along the Goechala pass itself. The snow covered pass and the mountain slopes on the sides look like skiing fields. As you walk along for another 20 minutes, you will finally see prayer flags and you know you have reached your destination. The majestic Kanchenjunga can't be any closer. It is interspersed with many glaciers. If you look back up, you will see many tiny glacial lakes that look so lovely. Often, you can even witness mini avalanche in the snow mountains surrounding you, the roaring sound of huge mass of snow & rocks rushing down the steep slopes. Tip: Goechala weather can be very unpredictable. In no time cloud or fog can come and put a white blanket all around. 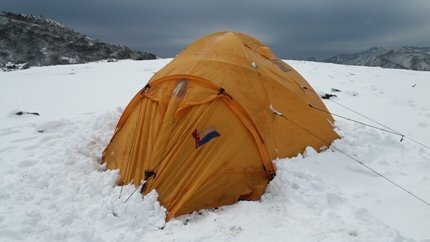 And if it gets windy (which happens quite often), you can't stay on the pass for long and need to get back to your camp. So if you have time, budget an extra day at Chemathang so that you have a chance to try your luck one more time. So you are now heading back along the same route that you came by. During this stretch of the return trek, the guide usually focuses on showing you the various high altitude flora and fauna, including rare birds and Blue Sheep. Try to carry a binocular, because I remember when our guide showed us a Blue sheep he spotted far away near a bush, it just looked like a tiny dot from a distance. Stay at Thamsing overnight. This stretch is an uphill trek through rhododendron forests. It takes about five hours to reach the dzongri camp back again. This time go up to the Dzongri top (the view point) and experience the wonderful sunset over the snow mountains. Stay at Dzongri overnight. Take a different route this time through a village called Jamling Gaon (also known as Jamlingthang). This village is named after Jamling Norgay, the fourth son of Tenzing Norgay. Like his father, Jamling too climbed the Everest in 1996. It's a nice place to take a break. On the way you will pass by lovely forests of magnolia and rhododendrons. During the spring time, the flowers bloom in different colors. In this area itself, you can see about 10 different types of rhododendrons. The experience is further augmented by the spectacular giant magnolias and their typical fragrance. This is an easy four hours walk back to Yuksom. You can either decide to stay overnight at Yuksom, or if you had pre-arranged a taxi, then head back for Darjeeling or Siliguri. 1) All trekkers (Indians as well as foreigners) should obtain the Kanchenjunga National Park entry permit as this trek route goes through the national park. This permit is also locally known as Trekking Permit. This can be obtained at the forest check post while exiting the Yuksom village. Trekkers usually pay up the fee and obtain the permit first thing in the morning before commencing the trek and it takes only few minutes. There are additional charges for camera etc. 2) All foreign nationals require an ILP (Inner Line Permit) to enter any part of Sikkim. This can be easily obtained from the Melli or Rangpo check posts (entry points to west and east Sikkim respectively). Note that Yuksom and Dzongri trek route is in West Sikkim. Read Sikkim Permits for detailed info. 3) The Dzongri/Goechala trek route falls in a protected area because of nearby international borders. So all foreign nationals additionally require a Protected Area Permit (PAP) and this can only be obtained through an authorized tour operator. This permit is issued in Gangtok and not in Yuksom. So essentially all foreign trekkers would need to book a trek package through such operators and do not have the liberty like Indians to get a local guide, porter etc from Yuksom and proceed for the trek. Although foreigners are left only with option of a trek package through operators which is more expensive compared to locally organized budget treks, I know of many cases where the local option falls far short of expectations and failed to meet commitments. Here are some of the best trek operators who can take care of all logistics during your trek including permits, guide/porters, tents, food, gears, transfers etc. You can consider the Darjeeling Tourism Card which can substantially help reducing your trek package cost. NOTE: Sikkim government has mandated that foreigners can not travel solo in any protected area, they must be in a group of 2 or more of their own (not combining with Indians). If you take a local guide and/or a porter from Yuksum (applicable for Indians only), it would cost around Rs. 600 for a guide and Rs. 500 for a porter per day (which includes his own stay and food). Permit fees for Kanchenjunga National Park along with additional charges for camera and several other surcharges would come to around Rs. 700 per person when you are in a group. If you go through a proper trek operator, the indicative package cost for Yuksum-Dzongri-Yuksum trek for 9 days would be around US$ 720 or equivalent which includes transfers from/to Bagdogra airport or NJP station, accommodation in tents, food, all permit fees, guide/porters, equipment etc. A similar 15-day Goechala trek from Yuksom would cost around US$ 1275. You can consider Darjeeling Tourism Card to substantially save on trek cost if you go through one of the partnering operators who accept the card and offers discounts. The best season is the summer which is the period between end of April until June end. Then another great time is the Autumn - mid September to October end. You should not attempt to trek during monsoon (end June to mid September) as stretches of the trail gets extremely slippery and muddy. Landslides and lose rocks blocking the approach roads are quite common in monsoon. It is very difficult and often impossible to trek in winter particularly in January/February. It snows very heavily after Dzongri and the trails become inaccessible and weather quite foul. You won't likely find any guides during such time. Temperature in winter can fall well below -20°C. Sometimes expeditions take place in winter with experienced mountaineering guides and I know several of them had failed. In Summer (May - June) the average day temperature varies between 15°C to 25°C, and night temperature between 8°C to 15°C. At Dzongri the day time temperature ranges between 7°C to 15°C and at night between 3°C to -2°C. In Autumn (Mid September to end October) the average day temperature varies between 13°C to 20°C, and night temperature between 2°C to 7°C. At Dzongri the day temperature ranges between 3°C to 10°C and at night between 3°C to -4°C. Till early May, the trail beyond the first view point at Goechala remains under snow. However by June, this part of the trail becomes fully accessible. However you will still find light snow at the high altitude areas even in Sept/Oct. You should be physically fully fit to take this trek. As I had already mentioned before, this is a moderate to difficult trek. While prior trek experience will be very handy, it is not essential though. Altitude acclimatization is a must. Beyond Dzongri, air gets lighter and with lesser oxygen. 1) Check out Darjeeling Tour Operators to know about the best guides and operators who can arrange the Dzongri and Goechala treks from Darjeeling. 2) Visit Trekking in Darjeeling to know about the great trekking options in Darjeeling hills. There is no direct bus from Darjeeling to Melli. The best budget option is to take a shared taxi (usually a Jeep type vehicle) that leaves from Chowk Bazaar stand at the lower town of Darjeeling. From Melli you can take another shared vehicle, but you may not always get one all the way up to Pelling (you can get ones occasionally during high season... summer or autumn). So take one heading to Jorthang or Geyzing, and change to another one for Pelling/Yuksom (you will likely need to change again at Pelling). Jorthang exit is hardly used by Indian tourists because there is no public transport on that route (bus or shared vehicle)... one has to take a private car and the road too is quite bad at several stretches. (i) I want to travel from Darjeeling to Yuksom. What is the best way to do this as a foreigner (given that I can only enter at Rangpo or Melli)? (I don't really want to visit Gangtok, but I will if this is the only way). (Also, I can't find any information on Melli and what forms of transport might be available from there). (ii) From Yuksom, I would like to hike up to Bakhim or Tsokha, stay the night there and then return to Yuksom. Do I need a Restricted Area Permit for this? Hi, the Rangpo check post is used for entry to Gangtok while Melli check post is for west Sikkim including Pelling, Yuksom etc. From Darjeeling you can take a car to Melli check post, get your ILP (Inner Line Permit) and continue all the way to Yuksom. Foreign nationals require a special permit (Protected Area Permit) for the trek. You can only get this through a tour operator registered with Sikkim Tourism department when you take a trek package. Darjeeling Trek Operators can also offer such a package. Note that foreigners are not allowed solo on that trail (you must be in a group of 2 or more foreigners). Only Melli and Rangpo check posts can be availed by foreigners to enter/exit Sikkim. Jorethang exit point is only for Indians and is a gateway to Darjeeling. I have recently completed the trek to Goechala and found your article very useful before the trek. On re-reading it now, it brought back memories of the awesome experience. I had earlier referred to your notes before hiking to Sandakphu- Phalut. Thank you for sharing such a well written guide! Hi Raj, Our group of 5-6 people are planning to do the Goecha La trek in 2015. We were planning to do the trek in January/February 2015, but we have no idea about the climatic conditions in Sikkim at that time. Could you advise us please? You can't do Goechala trek around that time. Trail beyond Dzongri will be under snow and inaccessible, and temperature can be easily below minus-25 deg Celsius. Try it in May/June. I read your article... It is a very helpful article and full of required information. We went for Goechela trekking last week.. But unfortunately could not complete the trek. Here is my story.. Initially We decided to take Buddha as guide.. But he was not available.. So I took Bhagirath's number. Bhagirath is the worst guide I have ever seen in last 7 years of trekking experience.. He does not guide anymore.. He works as organizer most of the time.. Bhagirath's phone number: 7872884453.. He and his brother Deebee was the organizer of our trek to Goechela .. We gave them full advance in the beginning of the trek.. Then we realized he sent a 13 year old boy with us as a guide who does not know Hindi/English properly.. Fooding and lodging was included in the package.. But we did not get minimum facility from him.. So we decided to come back from Dzongri.. It was a 7 days trek.. we returned in 3 days.. When we returned and asked for the refund, Bhagirath said he is not going to refund a single penny... He is a Liar, wicked guy.. We heard that he cheated so many travelers in recent years..
Buddha Singh is a Very honest guy... You can trust him.. My suggestion will be to stay at Yuksom for one day.. You will meet good guides and then hire them.. Anyway Taking rest just before starting trek will be a very good idea as you wont get proper resting place after Yuksom for next 7-10 days of trek..